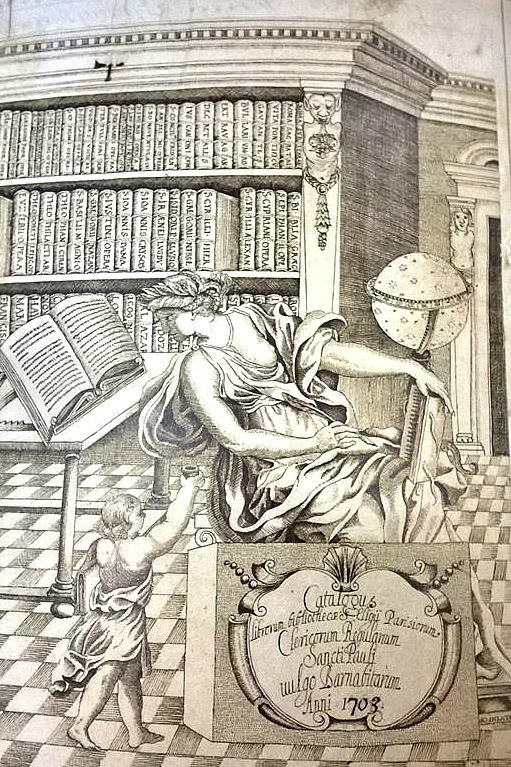 This frontispiece from a 1703 library catalog shows a classical figure engaged in cataloging a collection. In real life, cataloging has fewer cherubs and more computer screens. Catalogers work behind the scenes in the library. We’re usually found in our very quiet building, examining books, checking over bibliographic records, or typing lines of code. The catalog records that we work on are mostly used by people whom we will never meet. But the Cataloging & Description department occasionally receives questions from researchers, and those questions help explain why we put certain pieces of information into our records. For example, we recently got a question about the historical theses and dissertations that we catalog. A researcher compiling a bibliography of theses and dissertations for The Hymn Society found the record for a thesis or dissertation written by an FSU student in 1973. The question was: was it a thesis, written for a Master’s degree, or a dissertation, written for a Ph.D.? As technology has advanced, catalogers have been able to provide an increasing amount of metadata for each item they catalog. We no longer have to limit ourselves to the space of a 3×5-inch catalog card, and changes in our digital platform have allowed us to include more information for electronic resources as well. The record in question had been created in 1976, using older cataloging standards, and it didn’t contain the information that the researcher wanted. As we’ve been updating the records of historical theses and dissertations to current standards, however, we’ve been including this information in each record. Once we got the question from the researcher, we updated this record as well, so that now anyone looking at the record should be able to see that it’s describing a dissertation, not a thesis. This screenshot shows the information we entered into the catalog record: the 502 field includes the degree for which this work was written. We were ready to work on a festive collection. Each with the same poem. You all know which one. Plus archival items, including a spoon. Had settled our brains to describe each resource. And our records must help people find what they seek. Remembering concepts that she learned from FRBR. We would deal with each item, no matter which version. Now, pop-ups! now, postcards! now, stamps for the mail! On, parody versions! on, versions in Braille! Now catalog! catalog! catalog all! Happy holidays, all, and to all a good book. As FSU students were finishing up their final papers for the semester, at Complex Cataloging we were working on a group of theses and dissertations written by FSU students long ago. Our project involved almost 600 digitized works from graduate and undergraduate students, most of them written between 1920 and 1979. Electronic theses and dissertations are popular items for researchers: as of December 10, 2015, 1,974,053 titles in this category have been downloaded from the institutional repository. We wanted to create records that would make our digitized theses and dissertations available to anyone who needed them. From An Analysis of Typewriting Errors Made by Students in a Second-Year Typewriting Class at Leon High School, Tallahassee, Florida, Patricia M. Barrineau, 1954. These student works are windows into the past, giving us a look at a world that no longer exists – a world where the cutting edge of school technology involved typewriting classes and film reels, where many teachers were not allowed to attend the theater, play cards, or dance. Some of the works that we cataloged were written by teachers and librarians who were already working in the field while finishing their degrees. They wrote about the tensions and problems they had seen in their own schools and communities. Other works included personal details from contemporary authors that are available nowhere else. To help make these theses and dissertations part of the Digital Library, we had to come up with a way of creating records for the electronic works based on their print versions. First, an automated process was used to gather the catalog records as a batch. Then, the Complex Cataloging team, along with Amy Weiss, Head of Cataloging and Description, updated and enhanced the catalog records in WorldCat and FSU’s catalog. The records now contain information that will allow researchers to find them in a number of ways, and to know from reading each record whether that work is the one they want. Next, Annie Glerum, Head of Complex Cataloging, developed an XSLT program that was custom tailored for this project, using more updated XPath functions than other similar programs, to transform them into the format used by the Digital Library. Once these records are added to the Digital Library, researchers will have access to these fascinating student works that not only tell us about our history, but also make a contribution to scholarship in many fields. Told After Supper, Jerome K. Jerome, 1891. Are there ghosts lurking in the subbasement of Strozier Library? Probably not. But there are ghost stories, and some of them are hiding where you might not expect them: in Christmas books. 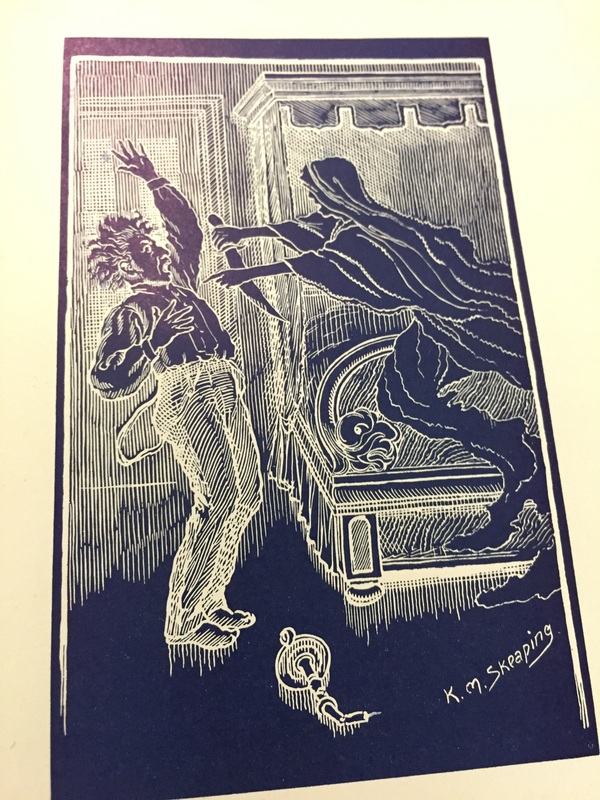 I came across some of these ghost stories while cataloging the Christmas Greetings Collection. 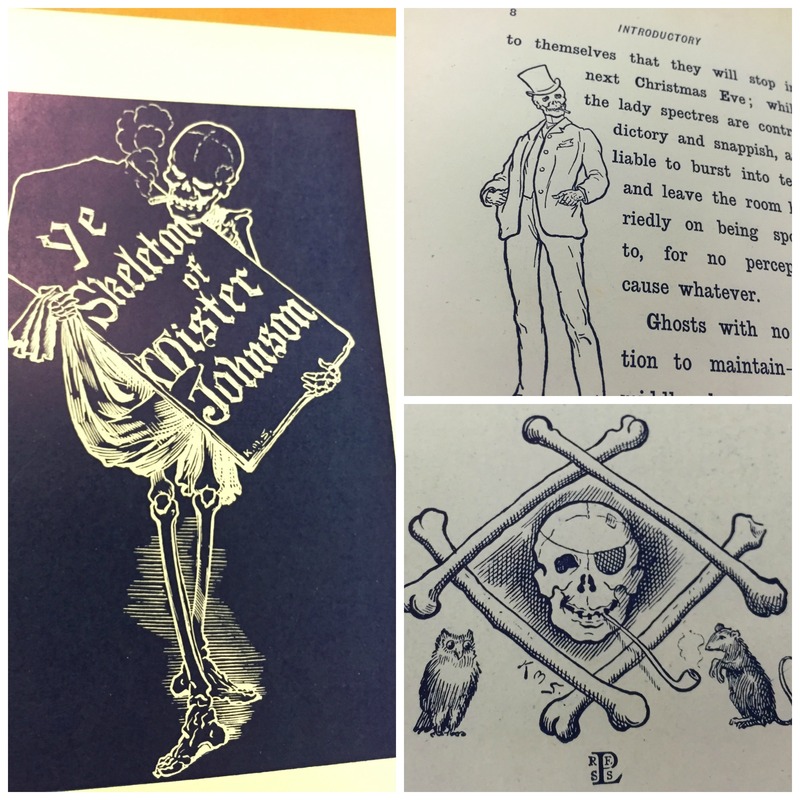 Like the Dime Novels Collection, the books in the Christmas Greetings Collection were discovered in boxes stored in the subbasement of Strozier, forgotten and uncatalogued. They needed records so that they could be found by any researcher who might want to look at them, and since I’m one of the Special Collections catalogers, I got to create some of those records. Most of the books in the Christmas Greetings Collection are gift books. They were privately printed and sent out by printers, booksellers, or book collectors to their friends as holiday gifts. 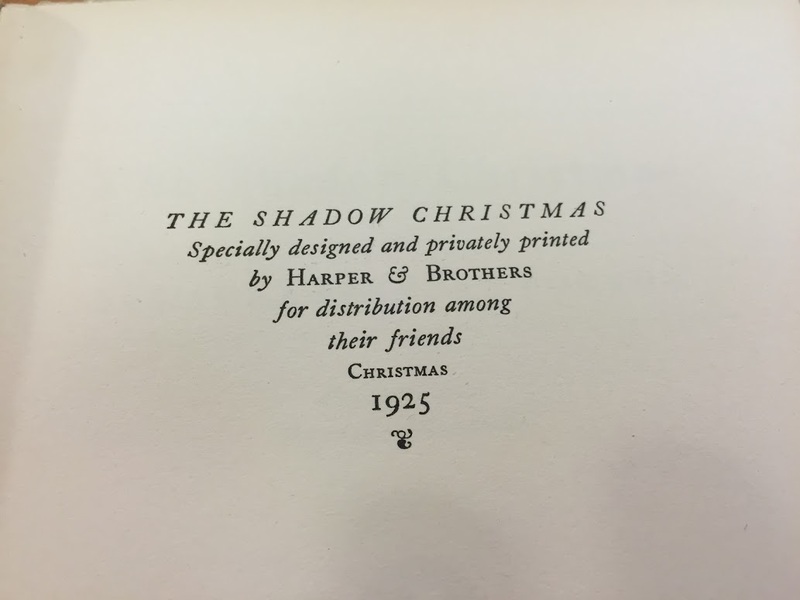 The Shadow Christmas (Laura Spencer Portor, 1925), one of the ghost stories in the Christmas Greetings Collection. They are little books, often the length of a single poem or short story, and they tend to be beautifully made. Some of them showcase a special technique of papermaking, printing, or binding. Some of them tell a heartwarming Christmas story or describe an old-fashioned holiday custom. And some of them are creepy. We cataloged this book under two different titles. You can find it by looking for The Vesalian Muscle-Men or by the title on the cover, Season’s Greetings 1944. One of the books in the Christmas Greetings Collection gave me a shock when I opened it. The cover looks fairly cheerful, with its “Season’s Greetings 1944.” Then you open it up. 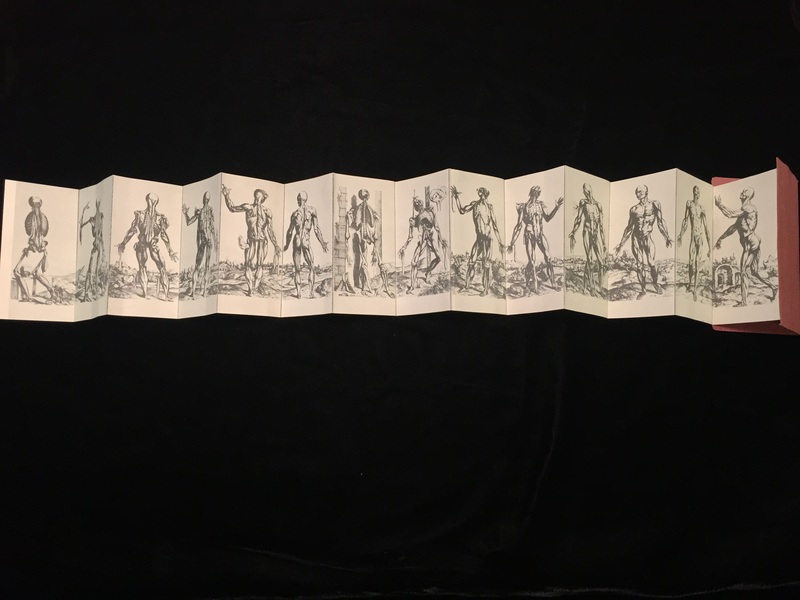 Accordion-fold pages allow you to see that the background of the figures forms one continuous landscape. Inside, the holiday season is being celebrated by a group of skeletons and skinless figures. This isn’t really one of the ghost stories in the Christmas Greetings Collection. 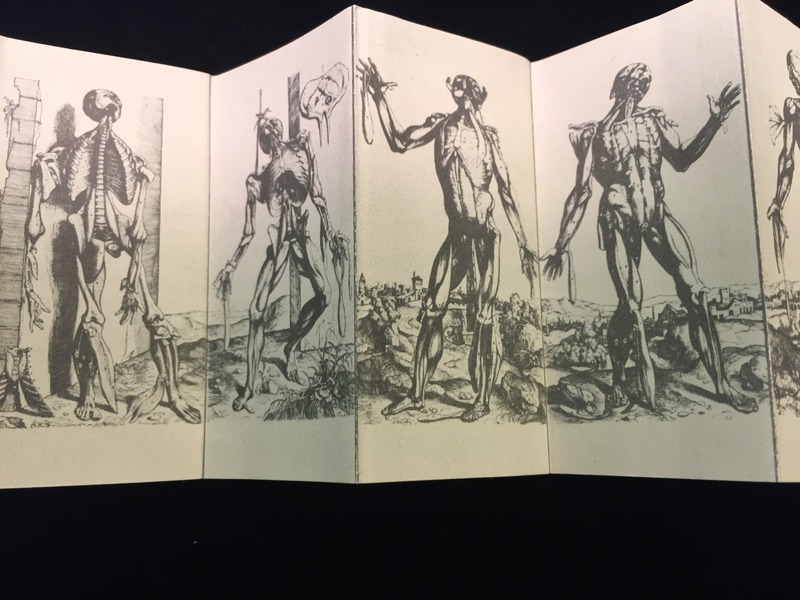 Instead, these skeletons are the “Vesalian muscle-men,” a series of anatomical drawings from one of the earliest and most important works on human anatomy, Andreas Vesalius’ De Humani Corporis Fabrica (1543). 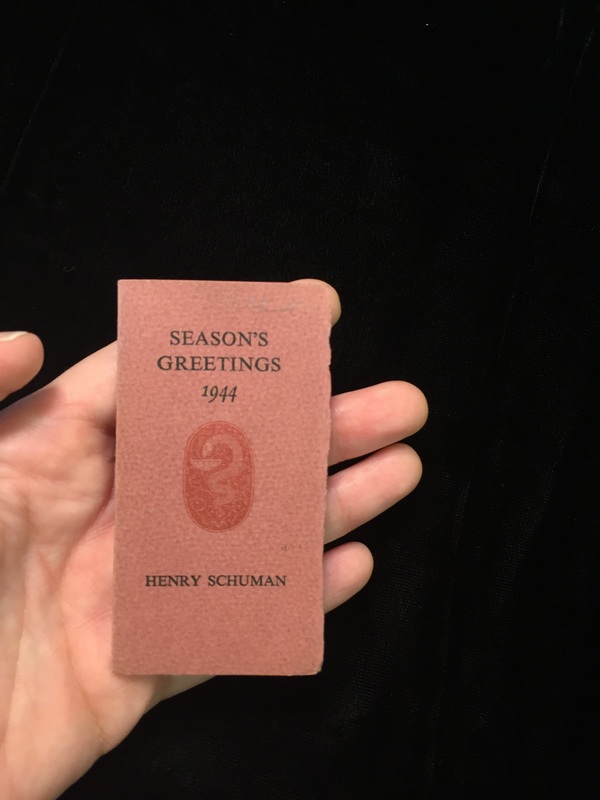 The book in the Christmas Greetings Collection was published in 1944 by Henry Schuman, an antiquarian bookseller who specialized in the history of medicine. It makes sense that he would send anatomical drawings to his friends at Christmas. It makes even more sense, though, when you look at all of the skeletons, ghosts, and other creepy things found in Christmas stories of the past. Christmas ghost stories are a British tradition, one that really caught on in Victorian times after Charles Dickens published A Christmas Carol in 1843. 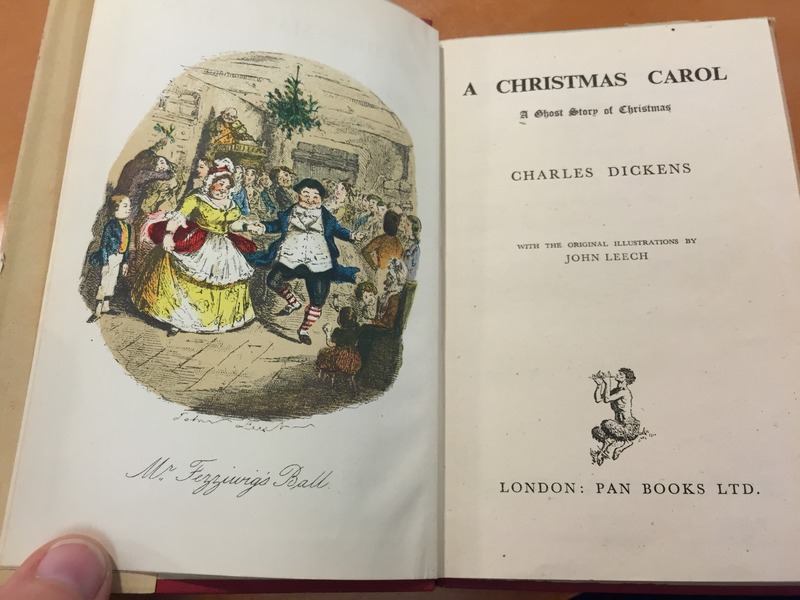 A 1946 edition of Dicken’s Christmas Carol from the Christmas Greetings Collection. For a while, both U.S. and British authors were writing Christmas ghost stories, although the custom continued much longer in Britain than it did in America, where Halloween become the holiday most associated with scary stories. So it’s not really surprising to find skeletons in the Christmas Greetings Collection. In this context, Vesalius’ anatomical drawings are not just scientific illustrations; they’re also connected to a larger tradition of Christmas literature. They reflect Henry Schuman’s interest in medical history, and at the same time they make an appropriately macabre holiday greeting. They belong with the Christmas ghost stories in our collection.